New material for chemistry text books. Researchers at the Max Planck Institute of Colloids and Interfaces have discovered a new aqueous crystalline structure of calcium carbonate known as calcium carbonate hemihydrate. Even the well-known can sometimes surprise. Calcium carbonate (CaCO3), also known colloquially as lime or chalk, is a mineral that has already been thoroughly analysed by chemists. But chemistry books, in which it is listed as occurring in five different crystal structures, now need to be augmented, because researchers at the Max Planck Institute of Colloids and Interfaces in Potsdam have stumbled upon another calcium carbonate structure in laboratory experiments. There is no shortage of calcium carbonate. It is found in many rocks and mountains as limestone, chalk or marble. It is an essential component of construction materials such as cement and plaster, but is also a regular annoyance in daily life – when it forms deposits in coffee machines, tea kettles or shower heads. But calcium carbonate is also found in animate nature, for example in mussel shells, certain algae and the skeletons of sea urchins. It is precisely the sea urchin skeleton that interests Peter Fratzl’s team at the Max Planck Institute of Colloids and Interfaces. Together with their colleagues from the Weizmann Institute of Science in Israel, the researchers are investigating how these animals form the complex crystalline shells for their soft bodies. It had been known that calcium carbonate is initially present in amorphous, i.e., disordered form and only later takes on the regular structure of calcite. The researchers wanted to find out how the transition takes place in detail in laboratory experiments in which they varied such things as the temperature or moisture level. It was Zhaoyong Zou, then a doctoral student in the Potsdam-based working group and now a professor in China, who made a surprising discovery in this context one day: under certain conditions, something was formed that did not look like calcite. “We first thought it was a result of contamination” Peter Fratzl, Director at Max Planck Institute of Colloids and Interfaces remembers. Yet, further experiments repeated under the same conditions always produced the same results. Not contamination The researchers had obviously discovered a new hitherto unknown calcium carbonate phase. “Determining its precise structure was not at all easy”, Fratzl admits. For one thing, attempts to produce sufficiently large crystals of the substance for the standard X-ray diffraction analysis used for determining chemical structures were unsuccessful, and for another, the substance proved too unstable for other processes. 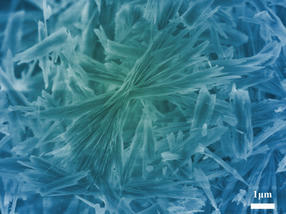 The researchers finally succeeded in determining the structure of the unknown calcium carbonate phase unequivocally with the assistance of numerous partners in Germany and abroad, including scientists from three other Max Planck Institutes as well as crystallography experts from the Technion (Israel Institute of Technology) in Haifa and the Johannes Gutenberg University Mainz, using various technologies. These showed that – as is the case with two other calcium carbonate phases – the substance is a crystal lattice that also includes water molecules in addition to calcium and carbonate ions in a ratio of 0.5 water molecule to 1 calcium carbonate unit. The substance is, therefore, called calcium carbonate hemihydrate, or CCHH as the researchers say for simplicity's sake. “It is not often in the life of a researcher that something completely unexpected is discovered that one hadn't actually been searching for”, says Peter Fratzl. In their initial euphoria, the Material scientists even came up with a proposed name for the new material: Golmite – in honour of the Golm district in Potsdam where the Max Planck Institute is located. “However”, says Fratzl, “we found out that trivial names of this kind can only be assigned if a substance can be proven to exist in nature”. Indeed, since their discovery, the biomaterials researchers have been asking themselves whether the new calcium carbonate phase could exist in nature. Whilst the experiments showed that, under moist conditions, the CCHH packs more water molecules in and eventually transitions into a different phase, there were also certain laboratory conditions in which the substance remained stable over several months. According to Fratzl, it could well be the case that CCHH plays a role as an interim stage in biomineralization processes, for example in the transition from amorphous calcium carbonate to calcite. Analysing these processes in more detail is, therefore, one of the scientists’ objectives. The relevant findings could also potentially be of use in technical processes in which calcium carbonate plays a role, such as processing construction materials containing cement. For the time being, however, that is mere speculation. Right now the relevant entries in educational books and encyclopaedias must be augmented to include another crystalline form of calcium carbonate.